This raised garden bed from Outdoor Living Today is great for growing small plots of veggies and flowers. 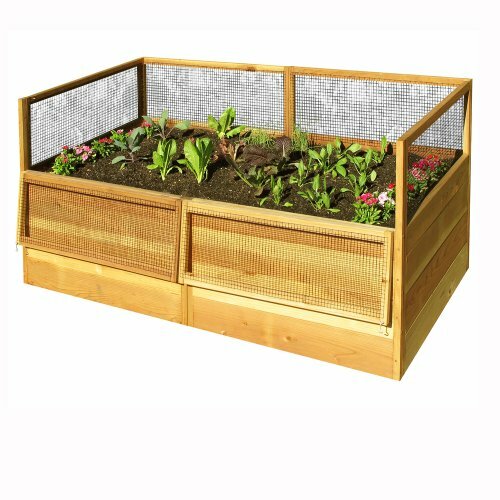 Measuring approximately six-feet long by three-feet wide and made from superior Western Red Cedar, the planting box supports raised beds up to 20 Inch tall. Perimeter fencing that's 33 Inch tall and backed with wire mesh will keep the dogs and pesky critters away, while two hinged front fence panels provide you easy access to your plants. The garden bed's Western Red Cedar is a sustainable wood of great beauty that is naturally resistant to decay and insects and accepts a wide range of finishes. At Outdoor Living Today, we strive to create Western Red Cedar kits like this raised bed as well as attractive and durable gazebos, sheds, playhouses and pergolas. Our products are designed to be put together with ease by anyone, no matter their building skills. The cedar raised bed can be assembled in one-to-two hours; all hardware is included. We recommend the following tools (not included) for assembly: a drill, 1/8-inch drill bit, a screwdriver, a level a tape measure, a shovel, safety glasses and work gloves. Happy gardening. Outdoor Living Today Raised Cedar Garden Bed with Trellis/Lid - 6 x 3 ft.